These take a little bit of effort, but are so worth it! In a small saucepan heat milk to 110°-115°F. Pour into a large bowl, stir in the yeast. Add sugar, salt, eggs. Beat with a wire whisk or wooden spoon until smooth. Stir in 2 cups of bread flour, beat well. Stir in 2 more cups of bread flour. Beat until well combined. Gradually mix the last ⅔ cup of bread flour in with your hands, pressing flour into dough and turning dough over, until the flour is all worked in. Place dough on a floured surface. Roll dough into a rectangle about ¼-inch thick, always keeping both sides well floured. Slice butter into ¼-inch thick slices, place on center third of dough. Fold left hand side over center third, then right hand side over both. Pinch seams to seal. Roll again to a rectangle ¼-inch thick. If butter comes through just spread back in and dust with flour. Repeat the rolling and folding two more times. Let dough rest for 10 minutes. With a floured rolling pin roll the dough into a rectangle ¼-inch thick. Cut lengthwise in half, then crosswise in half, making four rectangles. Work with each piece separately. Roll out to no less than ⅛-inch thick. Cut into wedges with wide sides about 3-inch. Roll up each wedge loosely, starting from the wide end. Place point down on greased baking sheets. Lightly curve each roll into a crescent shape. Cover and let rise until indentation remains after lightly touching. Beat egg and brush on top of croissants. Bake in a preheated 375°F oven for 12 to 15 minutes until a beautiful golden brown. Cool on wire racks. 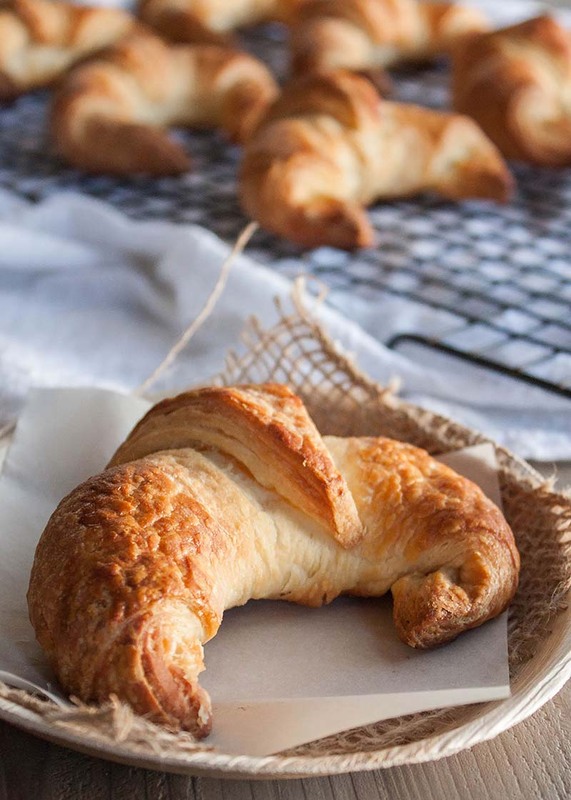 Note: The croissants freeze well. Recipe featured at Sweet Phi.